The content on VintageBodyboards.com is largely fueled by donations. 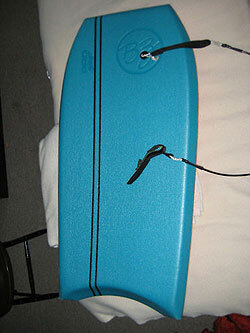 If you have an old bodyboard that may be worth sharing, we'd love to see it! Dust it off, snap some pictures, and we may put it on exhibit. Contact us at donations@vintagebodyboards.com for details. Angle: Angle yourself so that you shoot the photo from a head-on position. Shooting from an angle can cause the board to look lopsided or distorted. Leash: Detach the leash if possible. If not, coil it neatly or loop it back up and attach it to itself. Lighting: Use good lighting or a flash. If using a flash, be aware of the glare. You may have to shoot from a slight angle. Thinking about throwing away your old bodyboard? Before you dump your old sponge in the trash, consider making a donation. If it is in good condition, we may be interested in it. 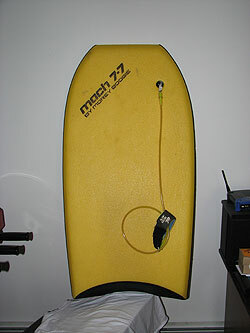 After all, this web site was created by a vintage bodyboard collector. Contact us at donate@vintagebodyboards.com for details.